So you might have heard of Snap Bibs... but then again you might not have... So today, I will be telling you a little about Snap Bibs... and there just might be a little giveaway at the end of this post. Everyone was raving about these amazing new bibs on instagram a few months after Snap Bibs opened up shop and I wondered what the fuss was all about... And in March of 2014 I was able to grab our first Snap Bib during an online sale for $8! I was so excited! My first impression was that it was extremely well made, however... Since our daughter was still so small it just didn't work at the time for us (Snap Bibs didn't yet sell the smaller sizes)... She was uncomfortable in it so it just got packed away in her stuff and forgotten about. In June of 2014 we moved and when I was unpacking our belongings I came upon our Snap Bib and thought "why not give it another try" since she had grown a lot since the last time we tried it... and am so happy that I did! We haven't stopping using it since! Not only is it better made than I even realized before, but its so much more functional than any other bib on the market! I don't have to be without a bib after every time we use it due to it being in the washer... All I have to do it wipe it off with either a wet or dry rag and its clean! And if it's really messy I can even run it under the water and scrub it with soap and water (I was afraid the back would come off when I first tried it but it's super sturdy and a good scrubbing with soap and water doesn't even bother it). Now we use our Snap Bibs every single day, multiple times a day... breakfast, lunch, dinner, snacks, even arts and crafts, you name it! 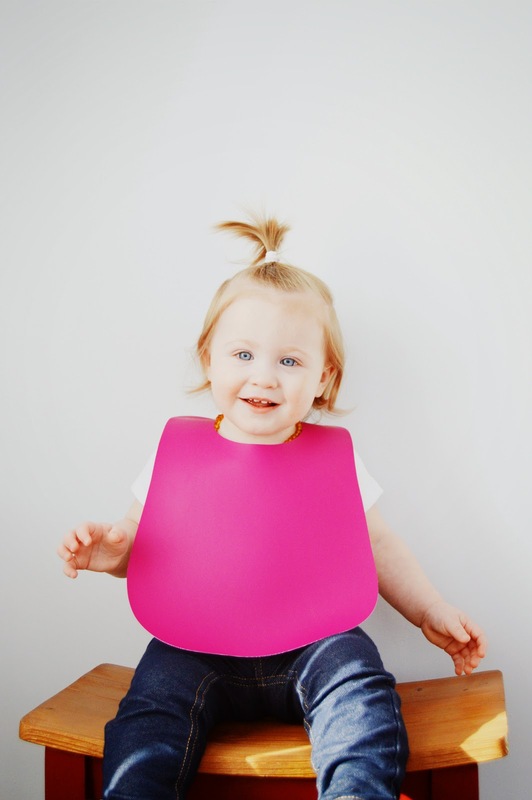 We are big believers in (and big advocates of) Snap Bibs now! They hold up amazing well and hardly any signs of wear even after being used multiple times a day for months and months! 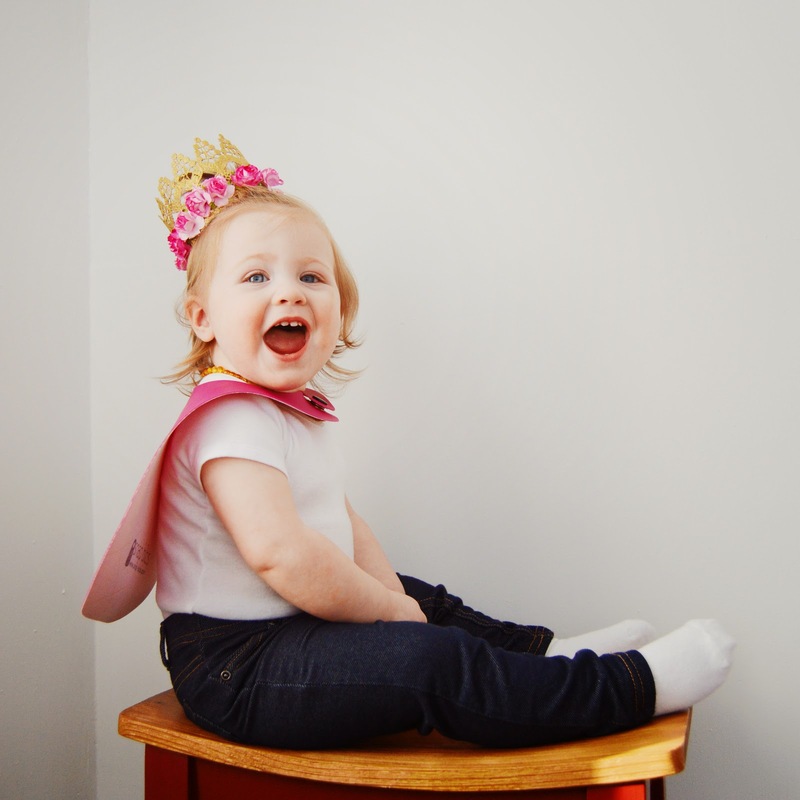 Our gold glitter Snap Bib was even a big part of Bella's 1st Birthday party outfit ensemble! The only thing I could find about these bibs that I didn't like was the fact that I sometimes get worried that my daughter's hair will get snapped in when I snap the bib closed, but even that is a long shot and really just trying to reach for anything to be a completely honest review (since I usually try to make sure her hair is out of the way first anyway). Snap Bibs is a small family owned business located (and operated) in Columbus Ohio, Snap Bibs was started by Katie Lewis after she just wasn't happy with regular bibs (you know the constant laundry from them and also the fact that her daughter could just pull them off during mealtime since they only have Velcro on them). 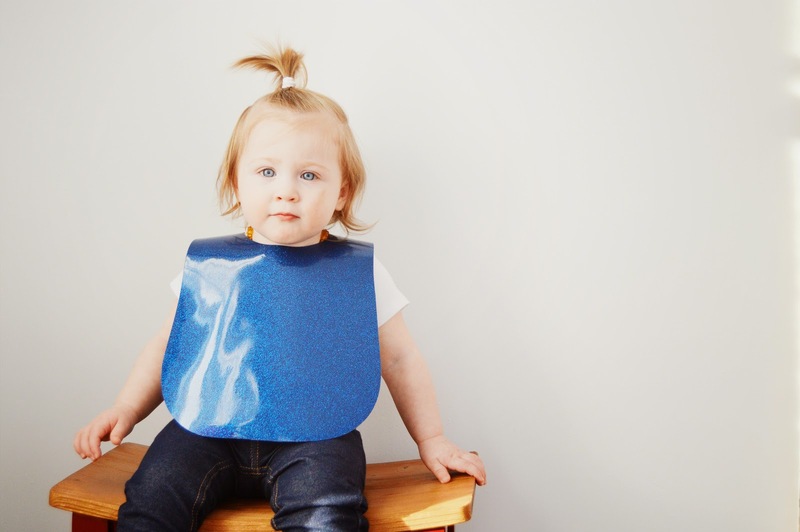 Each Snap Bib is made from thick and sturdy vinyl (yet still soft so they're easy on your child's skin and also roll up nicely to store in your diaper bag) with a heavy duty metal snap. 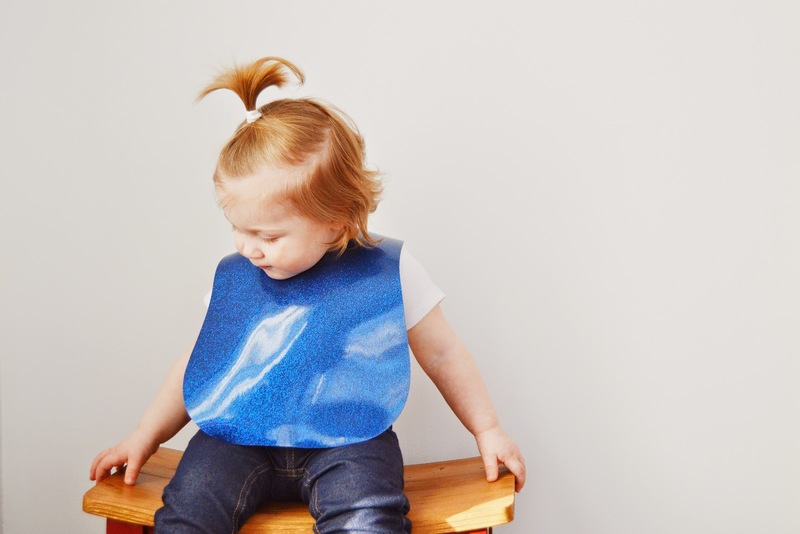 They come in size Large (best for older babies and toddlers) and size Small (best for babies just starting solids or especially petite toddlers). 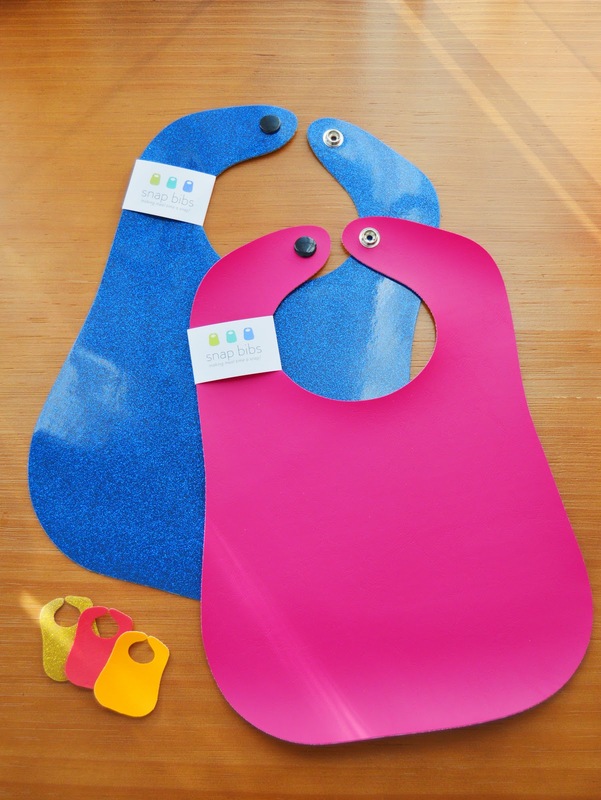 Snap Bibs come in a wide variety of both matte colors and glitter colors and shades, all so fun and very vibrant! No other bib brand even comes close! And I wouldn't suggest any other bib for a child! Even my husband raves about them! Snap Bibs are simple the BEST bibs out there! Want to try Snap Bibs for yourself? Snap Bibs has so generously offered to give a $15 shop credit to 1 (one) lucky Joyful Tribe Reader! The giveaway will run from Wednesday, February 11th to Wednesday, February 18th at midnight EST. A random winner will be chosen via rafflecopter and announced on the rafflecopter widget here on the blog on February 19th.